Dining indoor-outdoor, Gas Bar-B-Que, 2 Ovens, 1 Microwave, Gas Range. Dishwasher, a Gourmet kitchen to die for. All the appliances you need from wine bottle opener to dishes for the beach picnic. 39' Flat Screen TV's in all bedrooms, 50' Flat Screen in living room. Heated Salt water pool. Laundry room with top of the line appliances. Mood lighting everywhere. 2 overstuffed 8' couches and 2 very large punees for your lounging comforts. We have beach towels, beach chairs, beach umbrellas, and numerous boogie boards for you to use. We also have fins, masks, and snorkels. There are pool toys for all. The yard is beautifully planted with a lawn to play on.. We have planted fruit trees, so when the fruit is ripe, you may find some for you on the green chairs outside your Hale. With the ocean in front... all you have to do is turn around for a majestic mountain view as well. The sunrise comes over the mountains and is normally pink. Then turn around again and see the oranges, yellows and reds of the setting sun into the ocean. Its a funny story - We tried to sell it twice, it kept coming back. So, we got the message and decided to build on it instead. But since we already had a home we like, we chose to build one for you. It was completed in 2014, with NEW almost everything. This property is magical, come see for yourselves. VERY IMPORTANT: Please understand that we are in a quiet residential neighborhood and all noise needs to be brought inside the house by 10PM as a courtesy to the neighbors. ALSO.. this property has been rented to you .. large parties are not allowed. Please feel free to talk with us about this if you would like. Concierge Service Available. We have traveled extensively and know what is important to the traveler, so we bought you new pillow top beds in all rooms, flat screen tv's in all rooms with free wifi, and netflix in the living room. We have built a kitchen that wants for nothing, You will have a solar heated saltwater pool to float and play in, a fenced Private yard surrounded with tropical plantings. There are No stairs, not even into the house from the porticache. Panoramic Ocean View.. It IS truly amazing. 5 minutes from Kailua town - VERY centrally located. Close enough - yet the feel of being far away. The view of the ocean from your lanai and the bedrooms is spectacular!! This is why we named it "Kona Sunset Hale".. the ocean sunsets are the best in the world. We don't have air-conditioning because it is not needed. We have situated the house so that you have a continuos breeze throughout the entire house. In house temp at night 65-72. Brand New - front loader - and we supply the soap for you too. All house towels provided, with extras. Everything you need to create a gourmet meal, except for the food. Fiesta place settings for 8. Beach dishes. All that you will need, is supplied. A large kitchen with anything you need to cook with.. and if its not there, we will get it for you. Just ask. For the pool... and a floating Chair, blow up lounges and noodles. Beach Towels for all! 2 Boogie boards 2 Beach umbrella 6 Beach Chairs Masks, fins and snorkels. ( at least 3 sets) Numerous Toys for kids.. and noodles for adults. Numerous courses 20-30 minute drive away from the house. Solar Heated Salt Water surrounded by a luscious green grass yard to play on or lounge on. Our rental policy includes a 90 day 100% refund for any reason. When you request to reserve the property, it will pop up for you to read and approve. Disregard the "Cancellation Policy" below that does not apply to this property. It is a HomeAway policy that our personal policy precludes. Any questions, please feel free to ask me. 5 Star doesn’t do this home justice ! It’s even better and Sue and Walt are the perfect hosts who really go all out to see you have a relaxing and yet fun filled Hawaiian holiday. You know when people give rave reviews and say “we will be back”, well, we will be back and we have booked their home for next year already ! The quality of the home, the layout of the home and the view was “ Outstanding”. Looking forward to next year already ! Mahalo Sue and Walt. This house couldn’t have been better for our group of three couples. Wonderful location and the owners are very helpful. Our family had an excellent vacation. The house is very welcoming and has everything you need. A great place to stay for 6 adults. The view was nice to wake up to and we enjoyed our coffee outside every morning. The house is close to town so it was easy to get groceries and cook rather than eating out all the time. There was a binder full of information for stuff to do and places to eat when we wanted to which was very helpful. Mahalo for staying with us, we enjoyed having your as our guests. Please feel free to come back anytime. Perfect location. Perfect home. Stop looking and start booking! You will love it! We proabbaly searched 200+ properties hoping to find the perfect place for our family - me and my hubby, sister and her hubby, our mom and our 19 year old daughter. We all had VERY DIFF hopes for what kind of place to stay and this home met nearly EVERY ONE of our requirements. The 2 masters are wonderful. The kitchen is well stocked. The pool is lovely and it’s close to town. Honestly, we couldn’t have hoped for more. Susan was so helpful and we had a marvelous time. Thank you for everything! We will be back! Mahalo Nui for staying with us. Hopefullly we will see you again one day. We stayed at Kona Sunset Hale for the first 2 weeks of September. The weather was beautiful, absolutely no VOG and it was hot, therefore the pool was a must have. We had beautiful sunsets every night and enjoyed eating dinner on the lanai. As my husband would put it the house has great flow. The 2 master suites are at opposite ends of the house allowing for 2 couples to have their own private getaway. 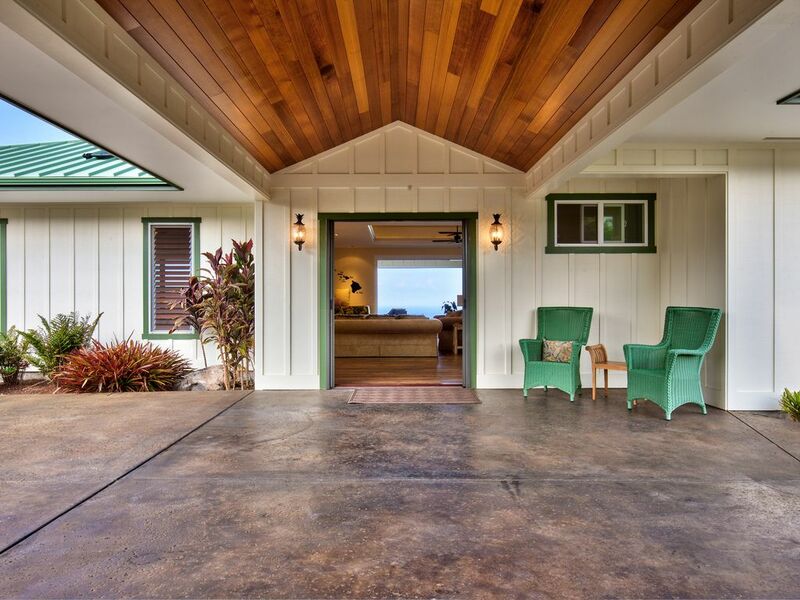 The home is in a perfect location just up the hill from the shops and restaurants of Kona. It is fun to sit on the lanai and watch the boats come and go, listen to the birds and watch the geckos. All the comforts of home and more are provided for by Sue and Walter. Don’t worry about packing beach towels they have plenty here. There are also beach chairs, an umbrella, boogie boards, noodles and snorkel equipment. Costco and grocery stores are less than 15 minutes away. The house is perfect, the owners are fantastic and the location is ideal. They have some books at the house to help guide you around the island. Don’t miss going to 2 step to snorkel or going to Hilo and seeing the waterfalls. Mahalo Sue and Walter, we loved your home and hospitality! Mahalo Tina for staying with us. We enjoyed having you as our guests. Please come back and see us again sometime. You are the first guests to enjoy the Old Kona weather, prior to the 2008 Halemaumau emission of vog. It is now GONE!!! and we are all so happy. I will be posting one of those great pictures you took on the site. We enjoy 21 of the 23 climates in the world, which presents us with multitudes of choices every day. From snowboarding/skiiing on top of Mauna Kea to swimming with the mantas.. All in one day if you wish. We often experience the red lava flow of Kileauea Volcano, strolling through a lava tube, and hiking the surrounding area. The waterfalls are refreshing and can be seen from Akaka Falls to Waipio Valley. You can plant yourselves on a black sand beach along side the turtles who rest there daily. Golf, golf. and more golf. The west side of the Big island is a golfers paradise. Courses designed by Jack Nicklaus and others of his notoriety. Challenging at times but always filled with the beauty of the ocean and the mountains. Hungry? We have the flavors from the most renowned chefs to the best ' local style' foods. A luau is a must do just to experience the tastes of the islands. Our beaches are like no others we have ever seen. Many are hidden from view, so you will not find them crowded with people, instead you will find turtles ( honus) resting, palm trees swaying, and a pool of aqua warm water waiting your arrival. The Big Island is a surfers dream. We have summer spots brought from the south and winter spots brought by the north. There are beginner breaks and breaks for those without fear. We also have a terrific surf lesson beach for those of you who want to give it a try. We have hiking, biking, running, walking, for all levels. I really can't think of anything we don't have... except snakes. Which is a good thing, especially when you are on that that treacherous forest trail. :) Please enjoy our island, you will marvel at the calmness and beauty offered to you while you are here... its called 'Aloha Spirit' We look forward to meeting you.